Sudbury is a good town, with plenty of interesting early survivals in its medieval street plan. Together with its extensive suburb of Great Cornard, Sudbury forms Suffolk's seventh largest town, and it is surrounded on two sides by the county border between Suffolk and Essex. Early modern Sudbury was prosperous enough to be divided up into three parishes. These were All Saints, St Gregory and St Peter, the last of which had been carved out of St Gregory's parish. St Peter and St Gregory were later recombined, and St Peter's church on the market place has fallen into disuse, but All Saints remains as a separate parish, just as in the 15th Century. 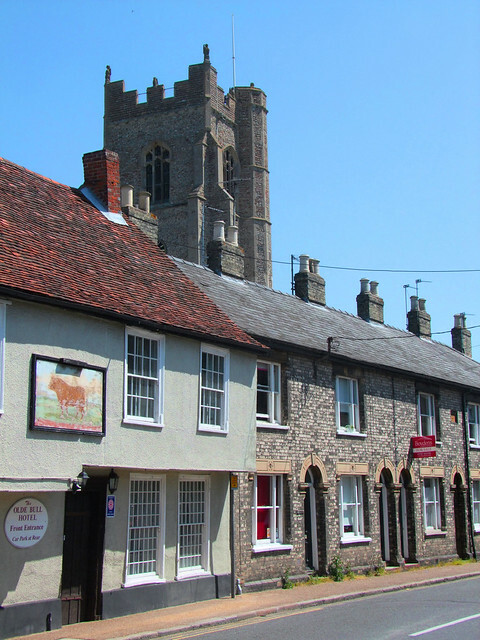 The grand tower is best seen when approaching the town from the south, when it appears above the neighbouring medieval inn. Ballingdon, that part of the parish south of the Stour, was in Essex until the 20th Century, a curious anomaly. The main road rushes you past, and so unless you turn off to take the winding lane to the south of the church that might well be your only sight of All Saints. If you do investigate, you will find that the medieval street pattern severely curtails the churchyard, with the east end of the chancel hard against the road. It is as if it has been shoehorned onto the site. There are surviving graves to south and north, with a fine rectory overlooking the north side of the churchyard. The large mausoleum in the middle is that to the Gainsborough family, merchants of this town, whose most famous member was the artist, Thomas. His statue stands on Market Hill, outside St Peter; but he himself is buried in London. This is a handsome exterior, and alone of Sudbury's churches had a spire, which came down in the early 19th century. The church was completely rebuilt in the 15th century, and the tower has similarities with that of St Gregory. Seen from the meadows to the west of the town, All Saints is the grander. There was once a porch on either side, but both have gone. Beside the south door, there is a very handsome holy water stoup. Just as St Gregory is in the High Church tradition, so All Saints complements it by being evangelical in character. Perhaps because of this the church is kept locked, but there are keyholders listed. Unfortunately, I forgot to ask which door the key was to, which led to the slightly absurd experience of going from the south side to the north side several times trying to get a door open. I must admit that it took me some time to discover that the key fitted an almost hidden keyhole in the south door. Even on a sunny day, this church is rather gloomier than its neighbour St Gregory. Some home made banners lining the pillars of the arcades cheered it up a bit. Above, the arches are decorated with shields and paterae, and the clerestory lights a fine 15th century roof. The woodwork is the most interesting feature of the nave. The pre-Reformation woodwork of the pulpit supposedly survived in such good condition by being boarded over for many centuries. The IHS symbol is a later addition by that great Victorian craftsman Henry Ringham. When I last came this way in 2001 there was a stunning lectern in the form of a standing angel, forming the parish war memorial, but this no longer appears to be in situ. I was pleased to find that the old benches were still here, as churches of evangelical character have exhibited an enthusiasm for replacing them with modern chairs in recent years. There are bell carvings on the most westerly row, suggesting that they were to be reserved for the bellringers. I suppose that it would be a very unusual bellringer today who attended services as well. There are a couple of more ancient survivals. Firstly, the screen into the south aisle chapel is original, and partitioned off the 15th century Felton chantry. Secondly, dating from 1622, there is an unusual mural in the vestry, to the north of the chancel. It was done when this was the north aisle chapel, to show the family tree of Edens. Each conjunction is depicted by heraldic shields, with roundels for names beneath. Mortlock thought that the writing had faded, but I don't think they were ever filled in. Look closely, and you'll see the marks made by the compass point of the 17th century mason who did the work. Outside, you'll find one of these compasses depicted among other masonic tools on a grave stone, to the north of the tower. Much destruction occured in this church in the 1660s. It had been (like so many) used for purposes other than worship during the Puritan Commonwealth, and continued in use as a prison after the Restoration. That so much has survived is remarkable, under the circumstances.